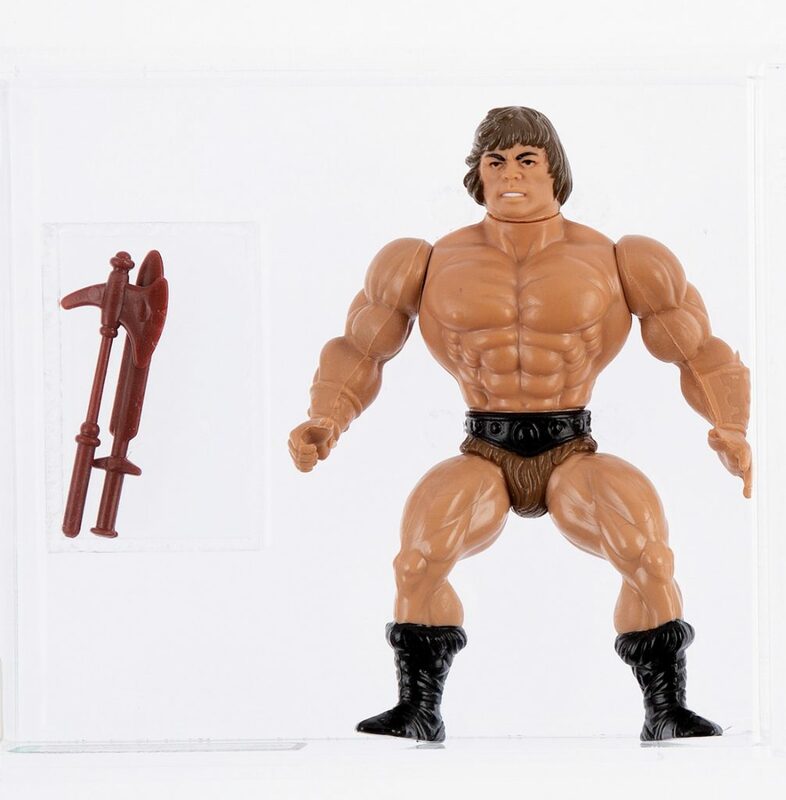 Anyone who has been collecting Masters of the Universe long enough has heard about the mysterious brown-haired He-Man figure that goes for so much money on eBay. He is often (and erroneously) called Wonder Bread He-Man, based on a long-running fan theory that he was sold as part of a promotion that Wonder Bread was running with Mattel. 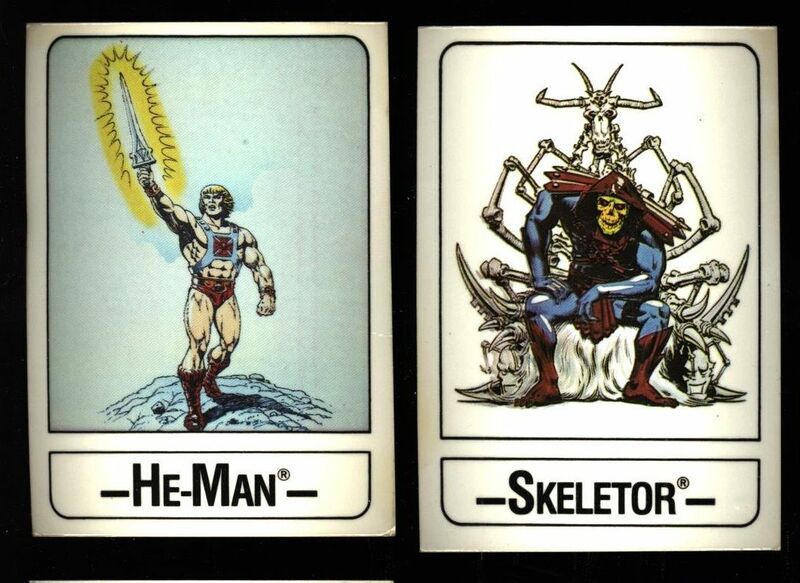 The promotion was actually for a series of He-Man trading cards featuring artwork by Errol McCarthy. 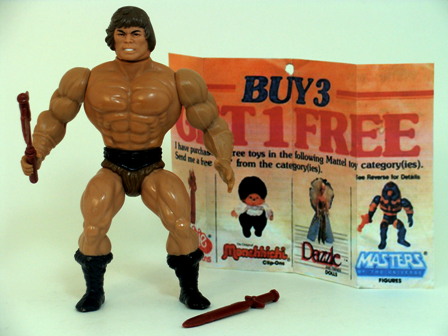 The figure itself is a He-Man figure with brown hair, a brown loin cloth, a black belt and black boots. He seems to have come only with the maroon sword and axe that came with the special edition of Man-E-Faces (which in turn were originally created as accessories for Castle Grayskull). Sometimes he is sold with additional maroon weapons and a black version of Zodac’s armor that was released in the 1984 Weapons Pak, however the feeling among many collectors is that those were not original to the figure. The most intriguing find so far comes from David and Darren Fowler, who first bought the figure about 17 years ago. 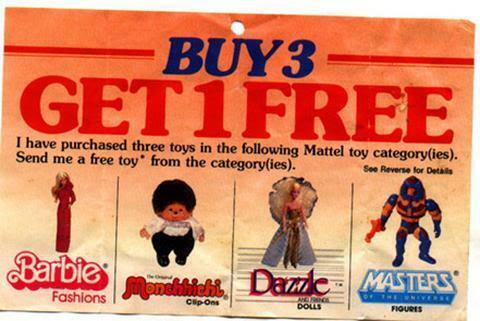 Theirs is the only example known to date to come bagged with weapons and a buy three, get one free offer from Mattel. According to the offer, the purchases had to have been made between January 2, 1982 and June 30, 1983, and submitted proofs of purchase postmarked by July 15 1983. 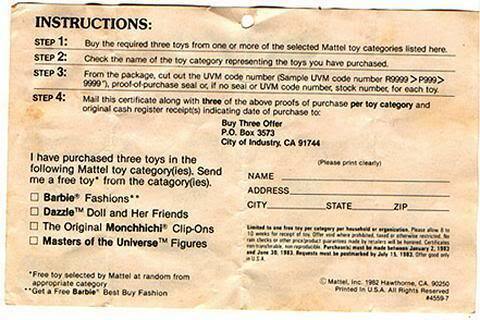 In the terms set out in the coupon, Mattel would send one random toy from the selected category (Barbie, Dazzle, Monchhichi, or Masters of the Universe). Those dates, plus the inclusion of the maroon Man-E-Weapons, makes me think this figure might have been released in 1983, even if it was actually manufactured earlier (it has a date stamp of 1981, like other first wave figures released in 1982). 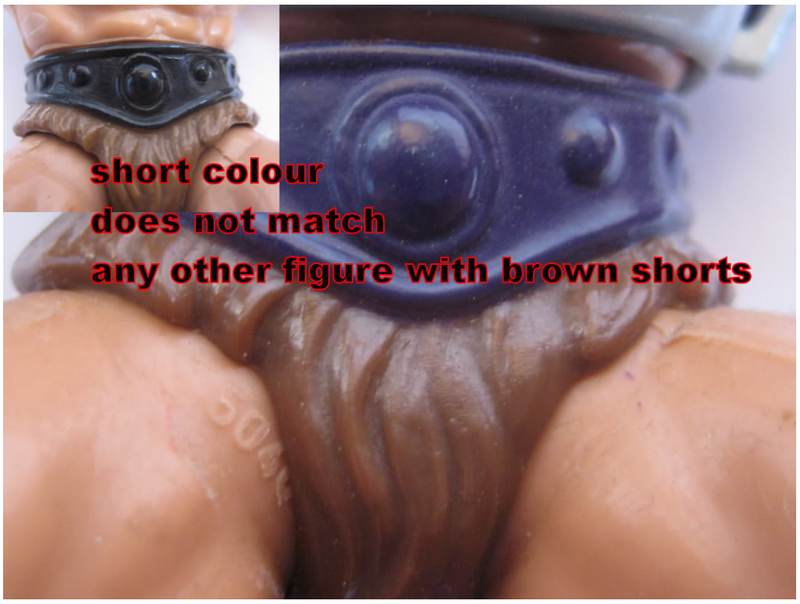 The figure also has two manufacturing details that seem characteristic of figures that came out either late in 1982 or early in 1983. The first is his belly button, which is perfectly formed. 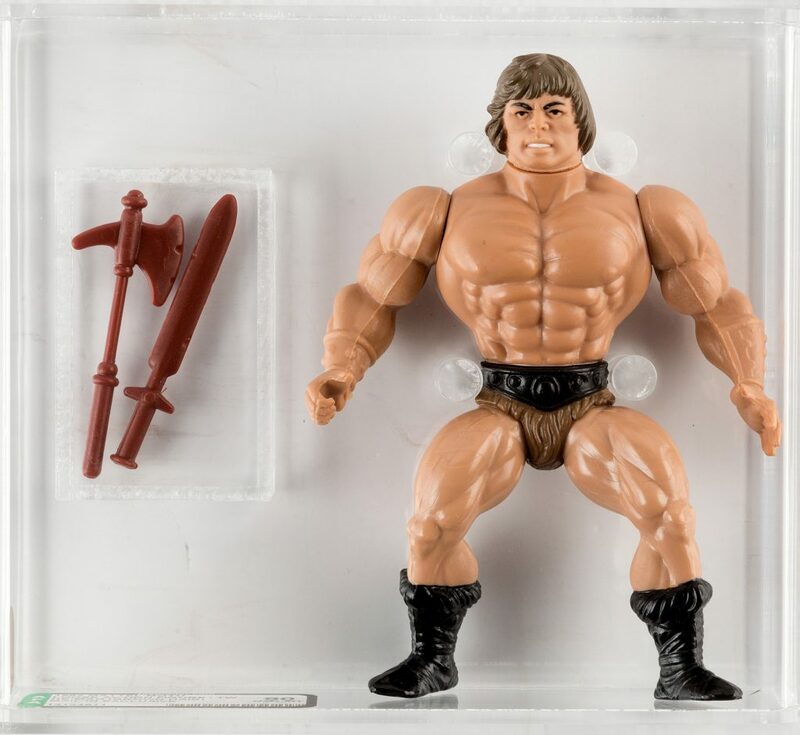 Early 1982 He-Man figures had irregular-looking belly buttons, and starting sometime in 1983 they started doing away with the belly button altogether, so this version looks like those He-Man figures released in the middle, where the belly button was normalized. 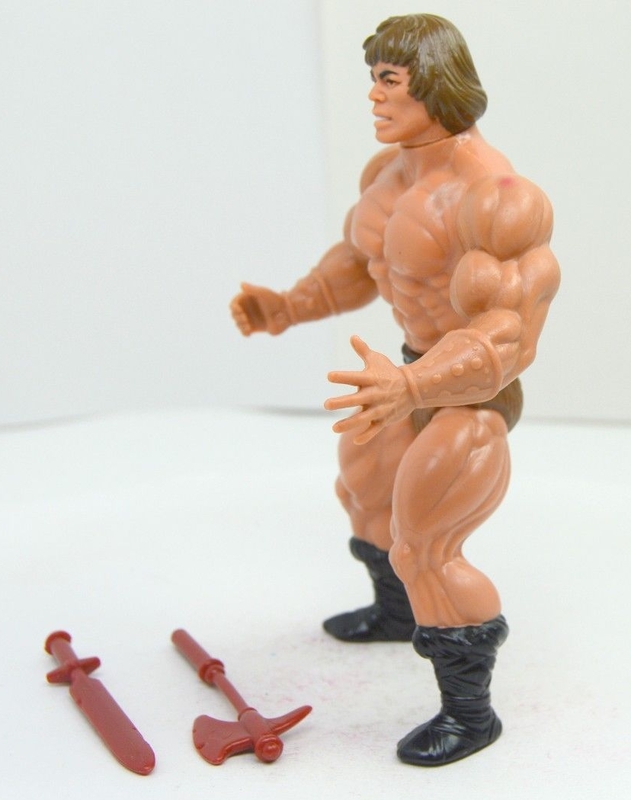 He-Man figures from that era also started having boots that were dipped in paint rather than sprayed, so the paint comes up all the way to the top of his boots, with no overspray. Savage He-Man has the “dipped” boots. For further reading on that topic, see this article. To me this seems like the most plausible source for the mysterious Savage He-Man. However, the offer doesn’t specify what figure will be given, and there is no known packaging associated with it, so we really can’t be certain. 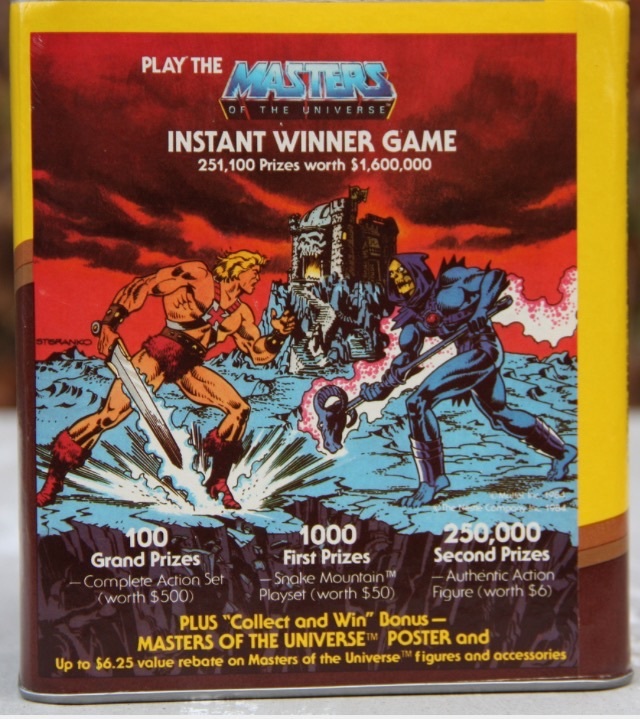 Other possible theories as to how it was sold include a Nestle Quick/Masters of the Universe promotion, a Jell-O/Masters of the Universe Promotion, and a promotion at the Children’s Palace. So far none of these has been confirmed – all we have so far is speculation. Perhaps a more interesting question is why the figure was produced in the first place. 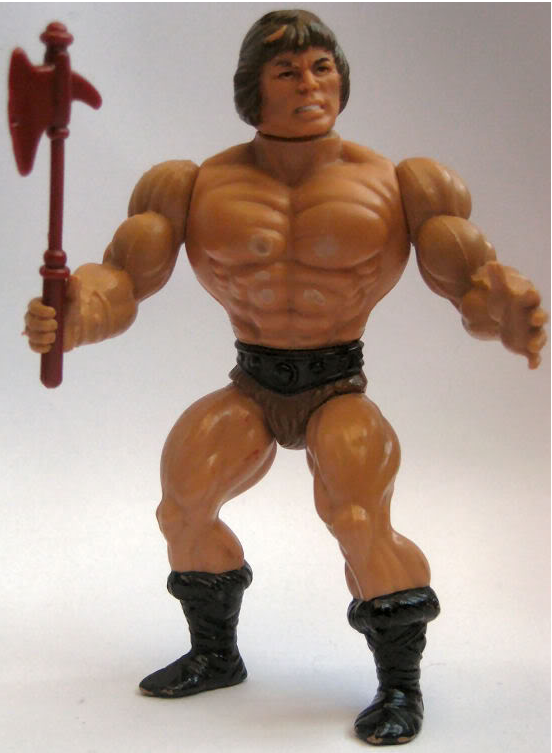 Why would Mattel have produced a brown-haired He-Man with darker-colored boots and loin cloth? As you can imagine there are many theories. 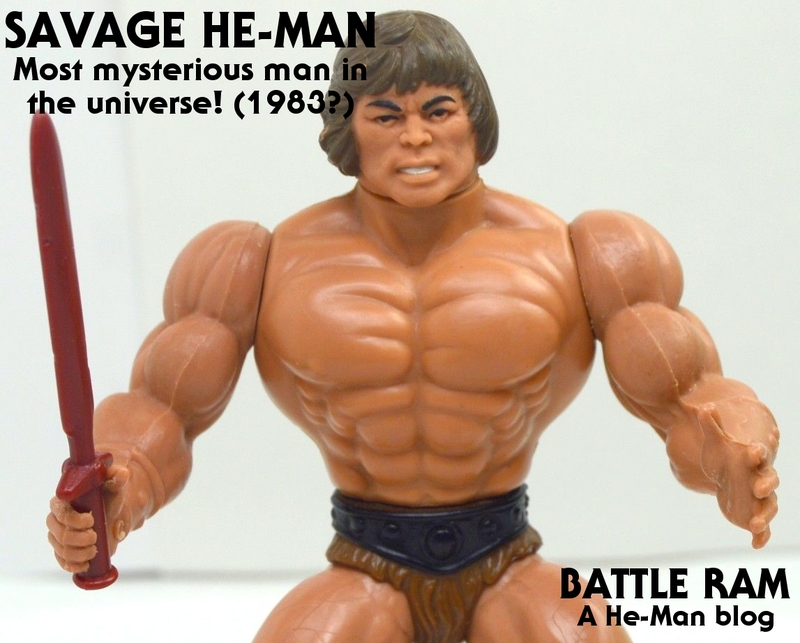 The most popular and persistent theory to date has probably been the notion that He-Man was originally Conan the Barbarian, and he was given a different paint job at the last minute so Mattel could reuse him for He-Man. And indeed, Conan Properties International (CPI) thought the same thing, and sued Mattel over it in 1984. CPI lost that case, partly because they were laying claim to some generic attributes that could also apply to a dozen different heroes in the sword and sorcery genre. 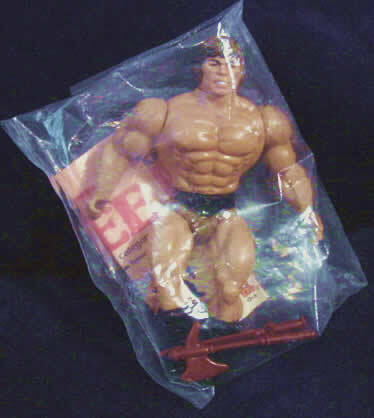 But more than that, the timeline just doesn’t support the notion that He-Man was a repainted Conan figure. 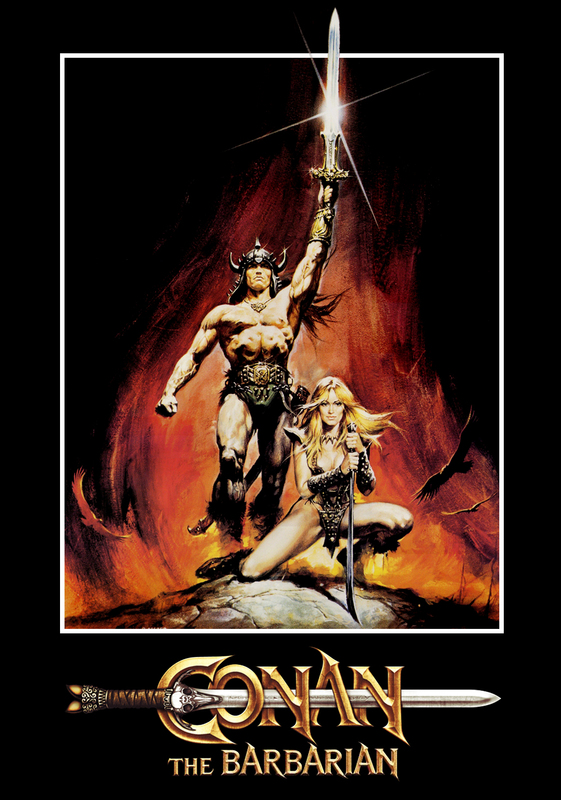 On April 24, 1981, there was an internal memo within Mattel urging negotiation for the Conan license. By May 5 a draft licensing agreement was secured, and by July 21 the agreement was finalized. From July 23 to September 21, 1981, Tony Guerrero worked on sculpting toys for the CPI license. However, in January of 1982, Mattel, realizing that the movie was going to the opposite of kid-friendly, requested the termination of the CPI license agreement, and by April 14, 1982 the termination was finalized. 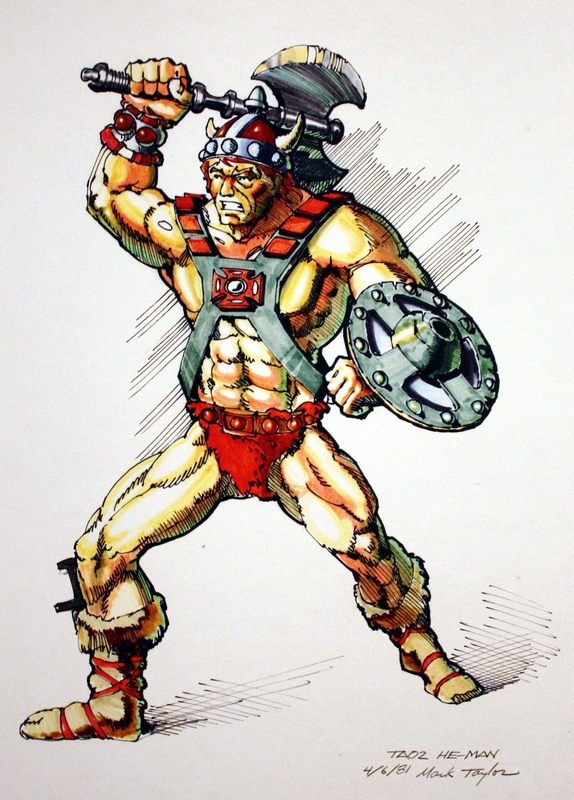 Mark Taylor’s He-Man B-sheet design, dated April 6, 1982. Published by Super7 and The Power and the Honor Foundation. 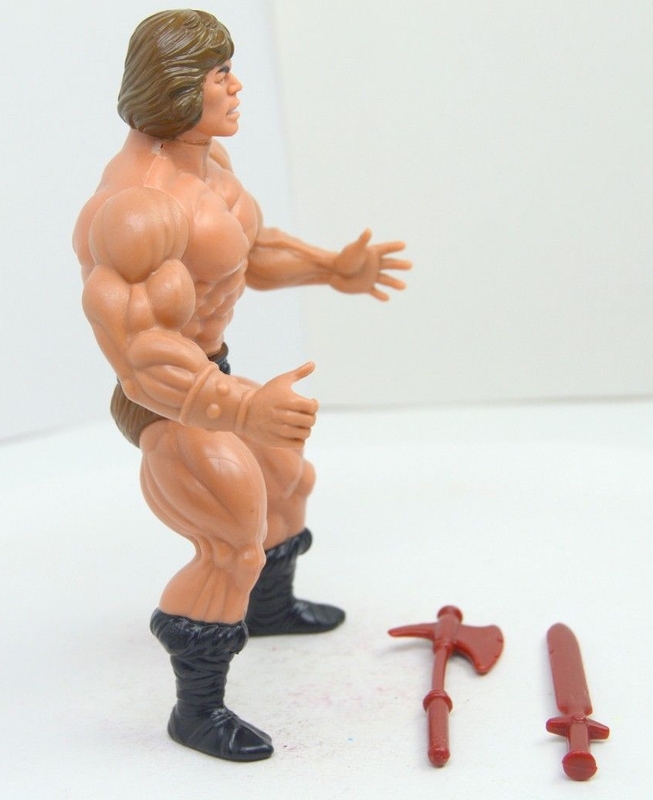 However, that does not rule out the possibility that Savage He-Man was an attempt to reuse the original He-Man mold to make Conan toys. Mattel would do that whenever possible to save tooling dollars (as they did when they reused previous Big Jim and Tarzan molds to make Battle Cat, Panthor, Zoar and Screeech). And, as Savage He-Man’s colors do seem to roughly match Conan’s, this seems like a fairly plausible theory. 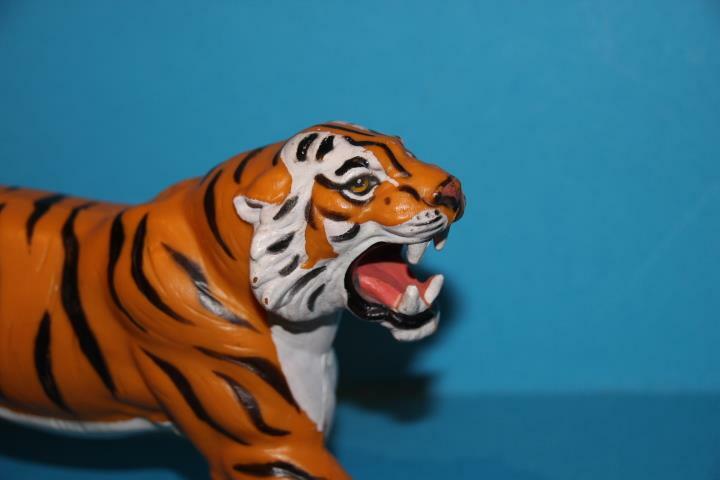 Big Jim Tiger figure, reused to make Battle Cat. Some people are of the opinion that the figure itself is a hoax. I don’t think that’s plausible. While fakes do exist, authentic versions of this figure have the look of a mass-produced toy. 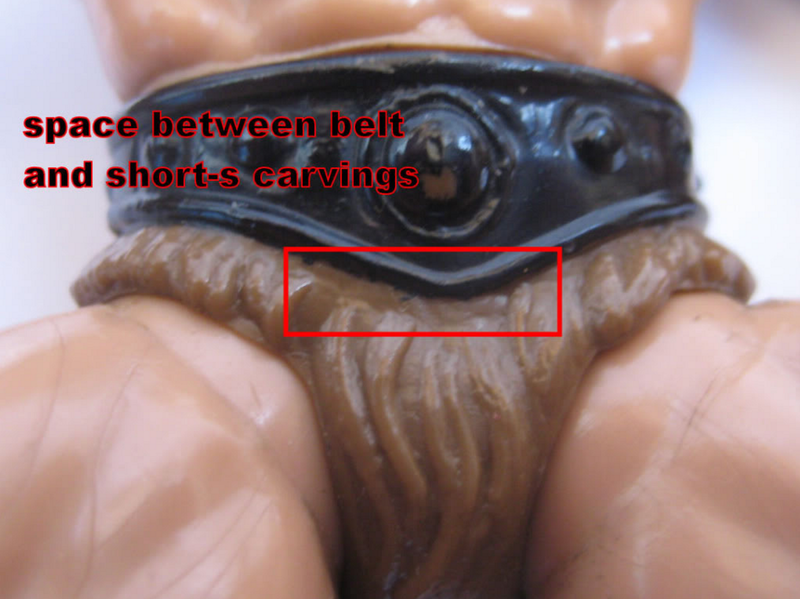 The loin cloth is molded (not painted) in a shade of brown plastic that doesn’t exist in any other Masters of the Universe figure. Most of them seem to have some fairly unique mold artifacts in that area as well (shared by some versions of Prince Adam). And finally, the figure has shown up in large figure lots where the seller doesn’t seem to be aware that the figure has any special value. Skepticism is understandable. 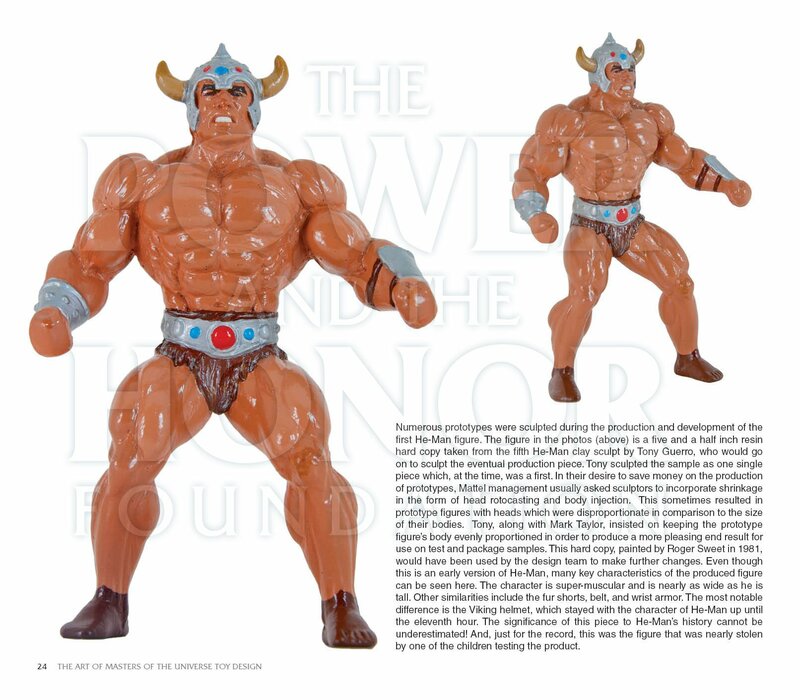 After all, Mattel has not found any records of this figure or its promotion, and no former employees to date seem to remember it (including Martin Arriola). 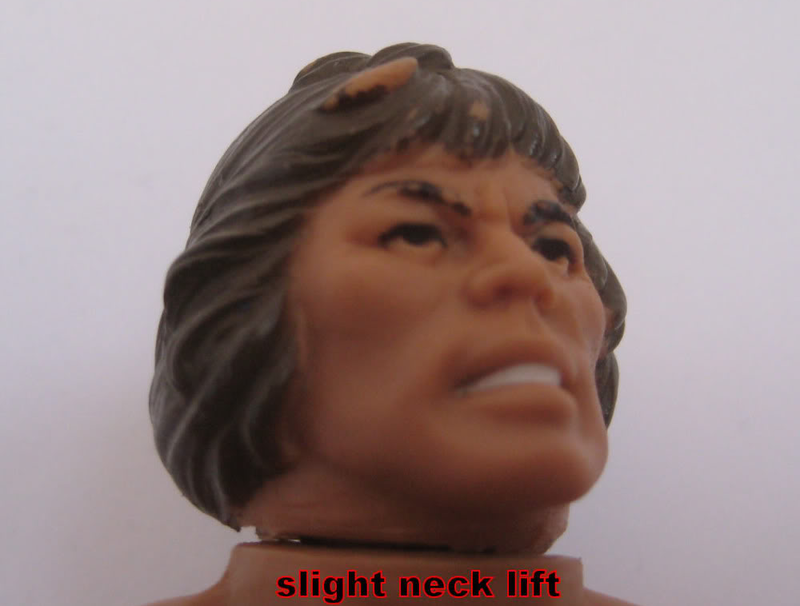 Still, the physical evidence alone strongly suggests this is an authentic Mattel figure. 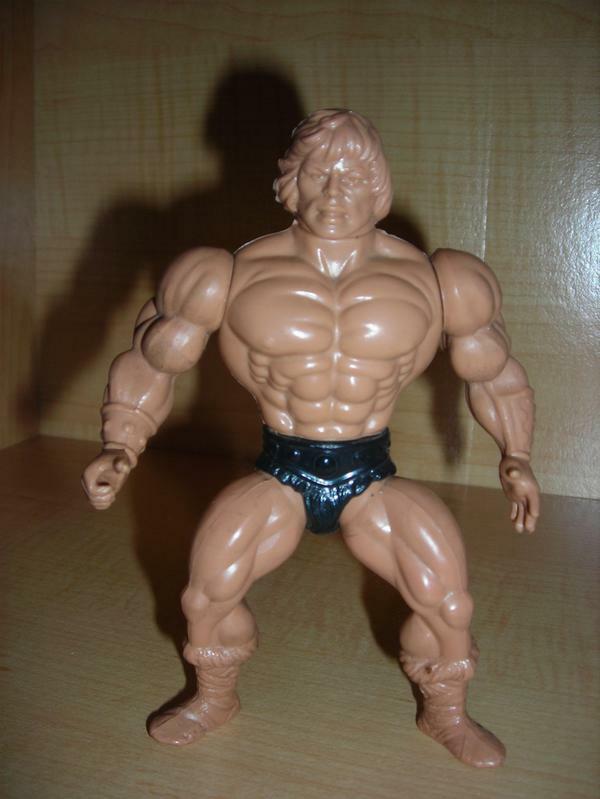 Another theory is that Savage He-Man was just a way of getting rid of some extra test run He-Man figures that were produced in alternate colors.. And to be sure, there is a test shot example out there that is reminiscent of the Savage He-Man, although his loin cloth is molded in black rather than brown. However, test shot examples from the factory are generally produced in very small numbers, certainly not enough to account for the number of Savage He-Man figures we find in the vintage toy market. 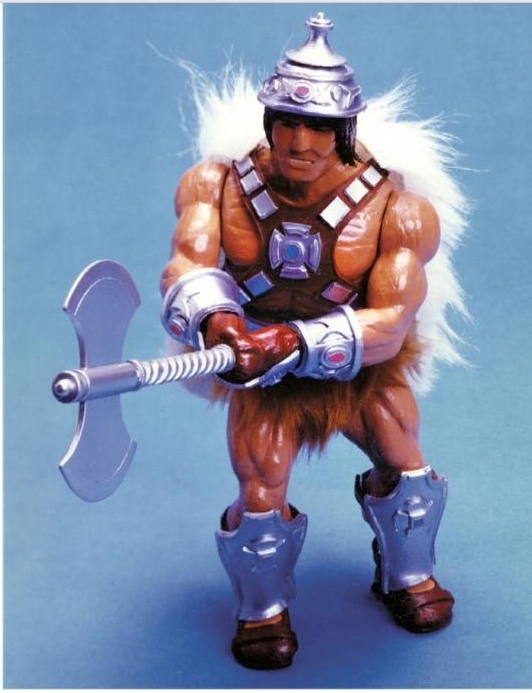 A similar theory holds that this was perhaps an alternate color scheme for He-Man that Mattel was toying with but ultimately rejected. That’s certainly possible, although that color scheme doesn’t match either of the B-sheet designs that were done for He-Man, and it doesn’t match the colors on any of the known prototypes, or at least not the prototypes that would have been anywhere close to toy production. Yet another theory is that Savage He-Man may have something to do with Buzz-Off. 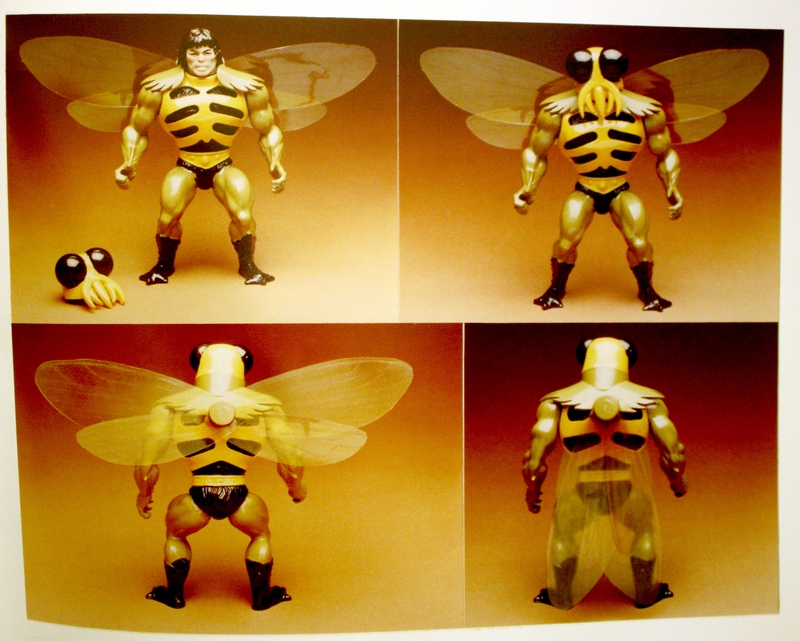 As I’ve discussed in an earlier article, Buzz-Off’s prototype actually had a brown-haired He-Man head, with a bee mask that would go over it. Of course the mock-up also had Zodac arms and legs, so this is by no means a slam dunk. For more on that, see this video by Alternative Mindz. One of my favorite theories, advanced by mozartpc27, is that Savage He-Man was actually an early version of Prince Adam, made before Filmation finalized the purple, white and pink look. Despite being released in 1984, the trademark claim for Prince Adam was filed May 23, 1983, earlier than any other third wave figure. In fact, the claim was filed the same month as Faker. 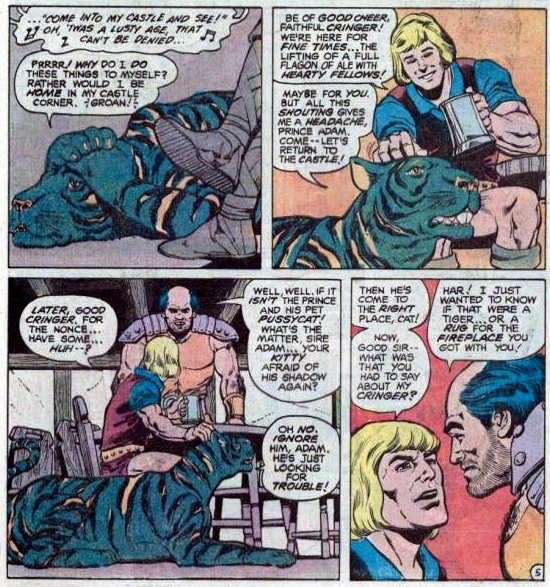 However, it should be noted that the earliest pre-Filmation comic book depiction of Prince Adam gives him brownish-tan boots (subsequent versions had blue and yellow boots or red boots), and blond hair. So if this was Prince Adam, it was a somewhat novel color scheme. At the end of the day, we really don’t know which of these theories is right, or even if any of them are right. And, frustratingly, we may never know the truth. If you’re interested in reading more about the topic, there is an epic, 2600-post thread spanning 14 years on the He-Man.org forums. Give it a read if you’ve got ten hours to spare. Update: An intriguing video recently surfaced, shared by Hong Kong Kilnt. It’s a claymation sequence from a movie featuring Masters of the Universe characters, including what appears to be Savage He-Man. You can watch the full movie here (thanks to Dušan Mitrović for the link). Update 2: Manic Man (from the comments below) mentions that in the Japanese versions of Mattel’s Dino-Riders toyline, blue-eyed and blond-haired figures were often repainted with darker hair and eyes. So it’s also possible that Savage He-Man was recolored for the Asian market. Perhaps Mattel did a test run of He-Man in these alternate colors before abandoning the idea. It seems as reasonable a theory as any. 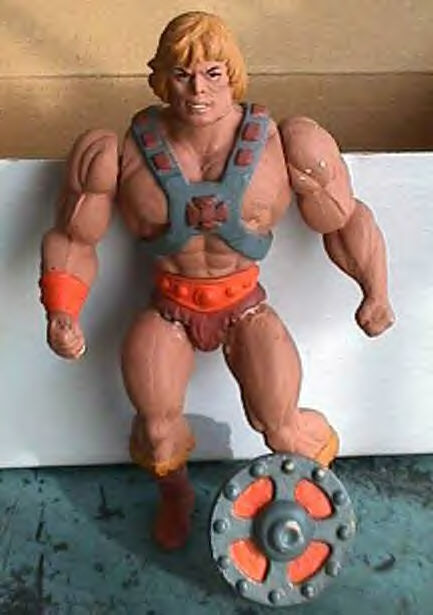 I totally would buy a custom Buzz-Off with a He-Man head on it. Eh? It’s wasn’t meant to be He-Man. It’s a prototype figure for Bug-Off and He-Man head was only a temporary placeholder. Another great and awesome read!!! I had always heard the Conan story but I think now I like the Prince Adam theory the most. Especially if it was like the comic you talked about a couple months ago about He-Man being from a savage tribe and gaining the power of Greyskull…sorry to paraphrase. Thanks Targo! I favor the Prince Adam theory too, but honestly, I have no idea what the real answer is. Maybe someday we’ll find someone who worked at Mattel who remembers this. Yeah, but the mystery is half the fun!! Thank you! I do like the Prince Adam theory, but I probably wouldn’t bet money on any of these theories. It’s all pretty speculative! I’m never convinced on the Prince Adam idea.. they were far enough along to have a production run but changed there minds.. the lack of the plug is very interesting.. It’s not a Test shot as.. well, if you know about Test shots, the lack of plug make sense but that’s about it. production paint etc is just stupid. also they don’t make that many.. Personally, I would forget the buy 3 voucher as probably not original with it BUT suggest the idea they aren’t American. Okay, I know they aren’t made in America but Knock-off. Mexcio or Argentina. Both have a history of figures which are just little plastic bags with a cardboard tag. 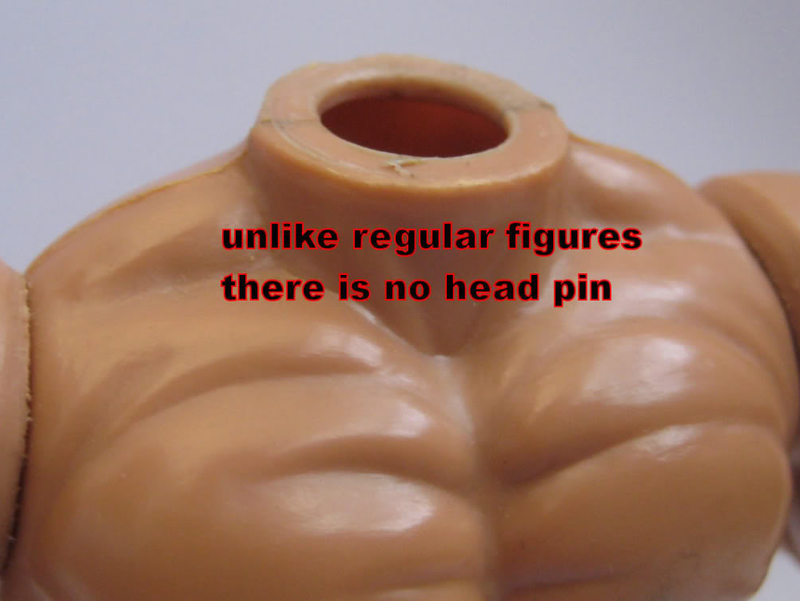 the Lack of the plug, slightly debatable quality control, mold damage (though such damage does, as you point out, happen as the range goes on (Heavy use/reuse of a mold always leads to damage)). of course, being such a widely discussed issue, not too much more can probably be added.. though at the same time, a lot of issues became confused with ‘mis-remembered’ facts from childhood (over 30 years ago) and people that don’t quite know how things work adding ideas (though i’m not the biggest expert in the world, I know enough to say it’s not a test shot, and find it odd that soo many were made (which hints at production run) of something which had not been finished to a set degree.. you don’t make a production run of a few hundred for a figure which you haven’t agreed the colours for. there should be at least a hand painted mock up before. Also, come on.. Mattel isn’t known for wasting money on these things.. I kind of hope that the mystery is never resolved. The answer can only serve to disappoint. Who built Castle Grayskull? Oh, King Grayskull did. Boo. Who is the Unnamed One? Oh, it’s an edgy goth Orko. Boo. What does Horde Prime really look like? Oh, it’s just another Hordak but red. Boo. Let some mysteries stay mysteries! okay.. sorry but.. no.. your research might have said about the Conan issue but.. no.. you do know that you are basically saying, Mattel, after they got the rights to the Conan film, decided to change He-man to have Brown hair (unlike Conan’s Black hair) and that hair colour was a major legal problem due to a law suit with the then license holders of Conan.. the earlier more ‘Conan’ version (as they call it) had a completely different head with a molded helmet (something which Conan.. erm.. didn’t wear in any story that I remember, and not much in the related comics/toys/films etc).. plus, as pointed out, there is the mold degrading on the figure. that means the mold had been used a number of times and was starting to ware.. ALL Molds do this. If you do your own home resin casting, this will happen after a short amount. If you use the big time Steel molds, this will happen later but with the amount of figures being produced, probably a few years into the range it’ll start to appear. By the time Prince Adam was made as a figure, the mold was starting to degrade. Mattel would have the option to either make a new mold (steel molds aren’t cheap but pretty much the best for such cases) or try to repair the mold. repairing is not nice really. 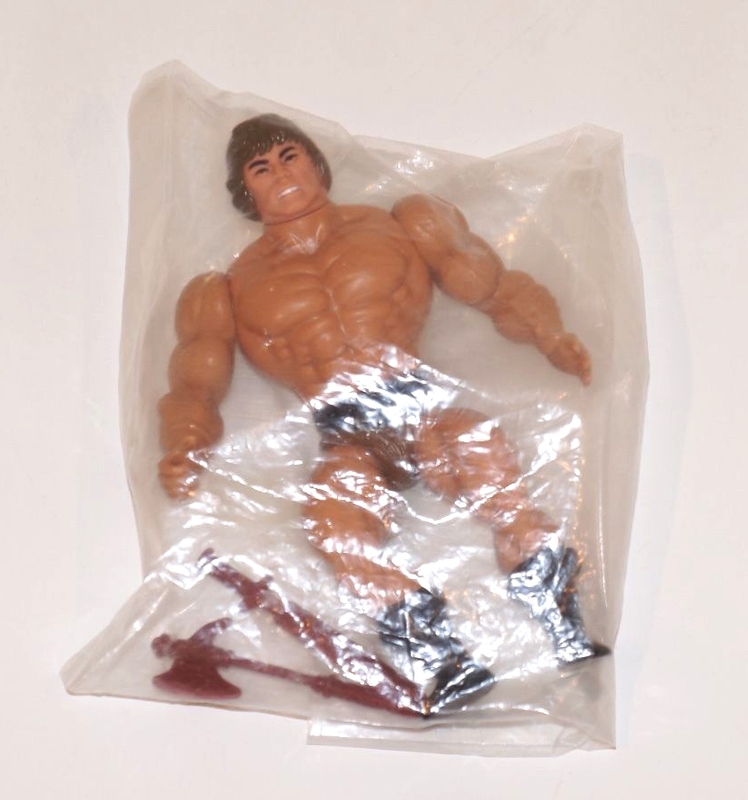 Since mattel loved being pretty cheap in it’s re-use of parts, the probably made a few copies of some of the molds in sets, so they had a number of arms, a number of legs etc. but due to how production works, they probably had a he-man set which had all the parts, a man-at-arms set which had a second copy of the molds of any shared parts etc. He-man was pretty much kept in production for every year they range was going. as Noted, the mold damage level is the same as for the Prince Adam run, but which appears fixed for later runs (i’ll need some really great images of various he-man figures to see when the damage was fixed or replaced, or what extra mold damage was done). This damage does give the rough time the mold was from. it was clearly AFTER He-man started production. which was after any major fuss with Conan. So the law suit period is completely out.. plus, you think ‘giving them away’ as a promotion (which is more high profile as that is the point of promotions) would be okay when they thought they legally couldn’t sell them? ehuh..
Hi! Ibig fan here! I have a petition to make. Could you make a list of MOTU characters order by their designers? Hi there, I might be able to do something like that. There are some question marks still, though.I know Martin Arriola designed the sticker for Faker, but I don’t know whose idea it was to do Faker in the first place, or who chose the colors (Mark Taylor designed the source material of course). I haven’t researched every toy yet, but I’ll look into doing something like this. Good morning Adam! I have nominated you for the Mystery Blogger Award!! Please get the detail in the link I have included. By the Power of Greyskull…have a powerful day!! Thanks so much, my friend. You’re too kind! You continually entertain and inform. You deserve it!! The answer if clear. These figures are time remnants that survived alterations in the timeline after a temporal incursion(s) by unknown parties. stupid point but just re-reading this made mf think of something… a number of toys of humans when imported into japan in the 80s (okay, top of my head I can only think of Dinoriders, but I know there ARE others) did a bit of localizing with there paint jobs etc. sometime Mold colours.. Pretty much all blonde, blue-eyed Dinoriders turned into Brown haired dark eyed characters. Of course, not all blonde characters had this done, but a fair number. Most likely due to Blonde not being a Asian natural colour..
Hi Manic Man – that’s actually a really interesting theory. If you don’t mind I’ll update the article to include your idea. We may never know the real reason, but that strikes me as a plausible idea – a run of alternate color He-Man figures intended for the Asian market. Why not? and while it’s not Mattel, since it has been known and done it makes it a bit better then a complete wild stab in the dark with nothing to back it up.. Thanks, that sounds very plausible to me. But the other mystery is why this figure was made in the first place! I believe it all happened. A cheap batch for non-US got cancelled and then promo’ed out in US. They seem to appear in attic collections in US. It would be interesting to see a map of discovery locations or claims. I brought home THREE of them on loan from a childhood neighbor in the 1980s, during the height of the cartoon. Name was Andy Kessler I believe. His friend Jared was my friend too, so Jared facilitated the loan at Andy’s house. Andy REFUSED to tell me how or were he got the figures (why? ), just that he just received them. I am not sure if he told Jared to keep it a secret. but Jared acted like he knew the big secret and how I could not buy them. If any of you have the motivation, send him a Facebook message https://www.facebook.com/jared.katcher (I am not on FB).